What Organic Farming Methods are required to be Certified? Posted 3:30 pm by Chris & filed under Organic Gardening. What Organic Farming Methods are required to be certified organic? To answer that question, we need to address some other questions first. What are organic farming methods, and how does that fit into your specific farm or garden? Organic farming methods combine scientific knowledge of ecology and modern technology with traditional farming practices based on naturally occurring biological processes. Organic farmers improve their products and practices by following agreed upon regulations which use natural pesticides and fertilizers. Natural insect predators are encouraged, crops are rotated to confuse pests and renew soil, and natural materials such as mulches are used to control disease and weeds. Organic farmers are careful in their selection of plant breeds, rather than genetically modifying seeds and products, they may “Breed” different plants, but generally the smaller farms use Heirloom seeds of those that I have spoken with. Farm size in great measure determines the general approach and specific tools and methods. Major food corporations are involved in all aspects of organic production on a large scale, whereas the smaller family farm, also known as the mixed vegetable organic market is often associated with fresh, locally grown produce. In Large corporate farms, usually not Organic, food is grown in very large areas, planting only one variety. This style of farming may be more cost effective, however, there are large downsides. They usually rely upon pesticides and other products to increase production. They have even gone to the point of spraying the harvested crops with a chemical, potato family, that keeps the different crops from sprouting, thus making it last longer during transportation and shelf life in the markets. Organic grain farms often involve much larger area. Larger organic farms tend to use methods and equipment similar to conventional farms, centered on use of the tractor in all aspects of the operation. The size and volume of product requires intensive work, and thus equipment is vital to their operation. The High priced tractors that the corporate farms usually use may not be right for you. However, if you are an Organic Grain Farmer, you need to weigh the cost of new equipment, compared to equipment that is mechanically sound to not only increase your output, and the time you spend on maintenance and possible contamination of your soil and crops with an older model. 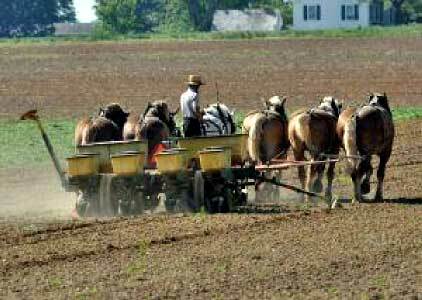 Today, Organic Farm Methods include the use of tractors and other motorized tools. The maintenance on which is closely monitored by the farmer and gardener. The smaller organic farms range from under 1 acre to just under 100 acres according to the Census reports. That appears to be changing as technology catches up with farming. There are ways to have your tractor provide for your needs, without the concern of equipment that may be expensive both time wise and maintenance cost concerns. There are also ways to lower the workload of the farm by paying attention to how you plant your crops! The less exposed soil you have on your farm, the less places weeds and unwanted seed have a place to grab a foothold in your fields. You need to follow the regulations agreed to by Organic farmers, as those are the guidelines to ensure your products meet the USDA standards which will reassure your clients that you have been inspected and agreed to only produce top quality products that will help them to continue on their quest to be healthy. If you are serious about increasing the profitability of your farm or garden, click on the USDA guidelines link (Organic Farming methods). It is an extensive webpage but will give you the required regulations to obtain USDA Organic Certification. We will be presenting a webinar with some expert guests on USDA Organic Certification, as well as other tips and money saving ideas in the near future. Permaculture Gardening, what is it really? Posted 8:16 pm by Chris & filed under Permaculture. 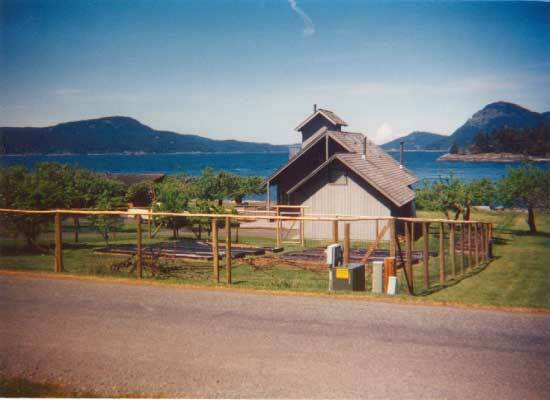 I have heard many definitions of Permaculture Gardening, What is it really? The encyclopedic definitions are as follows, so that you can get what Webster thought it was. Permaculture Gardening to me indicates a balance in the ecosystem that includes all aspects of that environment to form a balanced and healthy, culture capable of sustaining itself with or without the need for outside influences or resources. Webster Dictionary Online states this as the definition. : an agricultural system or method that seeks to integrate human activity with natural surroundings so as to create highly efficient self-sustaining ecosystems. However, I have seen definitions which state that permaculture can also mean that in some circles that the land or culture can be used for profit or subsistence for the good of the farmer or community. I agree with the Webster definition only, and I still do not believe that it is a complete definition. For this type of “Permanent Culture” or Permaculture Gardening to be permanent, there needs to be a personal study of your surroundings. What things do you like to grow? What produce or vegetables or berries can grow with self-seeding efficiency? If you take an inventory of the Life of your Dreams, what does it look like? What items do you need to have a Permaculture Gardening lifestyle? 1. Land that is secure from outside contamination. 2. Clean potable water that is recycled either by nature, or can be recycled by the land with some help from the caretaker. 3. Food that can and does re-seed itself, and grows without too much interference from the Caretaker. 4. Organic Compost to replenish the garden beds. 5. Natural Foraging foods to supplement the Permaculture Gardening. 6. A home that fits in with the environment and adds value to your surroundings. 7. Equipment that does not pollute, but reduces your workload so that you can enjoy your Life. 8. Relationship with the animals and insects on the land. 9. Relationships with your friends/family and visitors that builds up your life’s Dream. 10. But one of the most important relationships will be the ability to hear ,see, smell, taste and sense the changes in the permaculture gardening lifestyle as it continues on its’ own life circle. Just as we discussed in an earlier post about composting and worms, there is also a circle of life, growth, death and then regeneration in a complete permaculture environment. It is not always easy to spot, but it is there. That is the relationship that is handed down from generation to generation to continue to carry on the Permanent Culture that is possible with long term planning, caring and loving the lives that you take care of if you choose to build a permaculture gardening lifestyle. If you had the history of the life of the land you live on now, how it has been used and cared for or not, you can discover how to restore it to its’ most healthy state. You may also create the Life of your dreams through working with your environment rather than just attempting to conquer it. I know that this is a lot to think about, but looking at the finished product of your dream life will tell you if Permaculture Gardening is for you or not. I would love to hear what your Life Dreams consist of, and ask for you to send us pictures of what you have created and your long term plans! We will share more with you about our Dream Life Plans in future posts. Send us your comments, and fill out the form below to get our newsletter and as a gift, I want to give you a gift of a booklet I wrote about how to increase your profit from your Farm or Garden. I Heard of Worm Composting, What is it? Posted 11:51 am by Chris & filed under Composting. 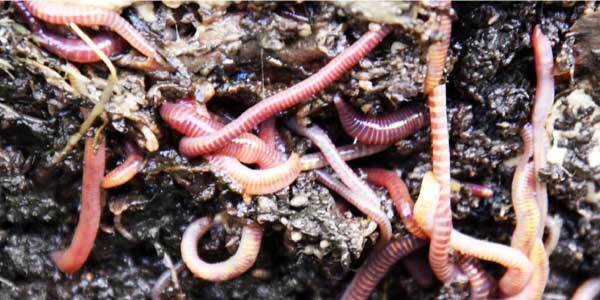 When I first heard the term worm composting I wondered how do you compost worms. I thought that the worms were the ones that aerated the soil by digging tunnels and eating things. Just as we use different manures to use as compost overtime, there has to be a process for turning it into compost. Worm composting is one of the best ways to take different materials and by the process of digesting mixtures of decomposing vegetable or food waste, bedding materials, they produce wormcasting, also known as Vermicast or worm humus or worm manure. Other names for the worm castings is worm humus or worm manure. Vermicast is nutrient-rich organic fertilizer and soil conditioner. Why is this such a sought after type of composting, and what are the differences of the compost that is produced? At the simplest level, the process of composting simply requires making a heap of wetted organic matter (leaves, food waste, no animal products though) and waiting for the materials to break down into humus after a period of weeks or months. Modern, methods of composting is a multi-step, closely monitored process that includes measured inputs of water, air and carbon- and nitrogen-rich materials. To increase the rate of the decomposition process, it is aided by shredding the plant matter, then adding water and on a regular basis turning the mixture. Worms and fungi can then further break up the material. Aerobic bacteria manage the chemical process. They convert the inputs into heat, carbon dioxide and ammonium. Ammonium is further converted by bacteria into plant-nourishing nitrites and nitrates through the process of oxidizing the ammonium compounds of dead organic material into nitrites and nitrates by soil nitrobacteria, making nitrogen available to plants. the nitrates and nitrites are chemically compounded to form nitrogen and sent into the atmosphere through composting with bacteria. Then the rain pushes them back into the soil where the plants use them as nutrients to grow and become what they are created to be. Now they die and decompose and during composting, release the nitrogen back into the atmosphere. That is how cow, horse, elephant and all other animals add to the environment by changing the fruit and fiber of the plants that they consume back into more material for composted material to start the process all over again. This is why you will hear me tell you why I really like local organic farms and gardens. It stays local, it grows locally better for usage in place, and it is healthier for your family as well since when grown properly the food will help your immune system to deal with “Local” bacteria. Healthy food and lifestyle (Clean water/organic food and exercise(oops I did say that word)). I like to get my exercise by working in the garden pulling the little weeds that may pop up, then eating what looks appetizing (need some extra energy you know) and bringing what I do not eat into the house for either our food or for friends and garden/farm partners. What we do not eat and gets past the point of being usable for our bodies, goes right back to the composting worms. They eat, we eat, of course, the deer and other animals have to get their share also. We are pretty selfish with the berries though lately. For the first three years we have been here, the squirrels and birds took all of the strawberries. This year, they are going to be under lock and key! Actually, just a better way of setting up the bird netting. We have also built a new three bin composting station so that the worms and bacteria will have their own place to hang out. We will then use that material after they have had their fill and place it back onto the garden. So all in all, worm composting is the best organic process of changing different materials back into the soil you want to grow in. I would like to invite you to sign up for our newsletter, to learn more about farming and gardening. We are passionate about helping you also! After all, our lives depend upon good healthy food! I would appreciate your stories and pictures of your farms or gardens, so leave a comment, send some pictures of your compost worms or bins and sign up for our upcoming newsletter below. I want to give you a gift of a short report for signing up for that newsletter which will help you discover 4 ways to increase your profits for your organic farm or garden. What Do I Need For Basic Organic Vegetable Gardening? Posted 9:32 pm by Chris & filed under Organic Gardening. I love Gardening, but What do I need for basic Organic Vegetable Gardening? This had been a question that I had asked myself ever since I returned from my time in the Navy. There was not much organic food on board ship, unless you count frozen vegetables. I always wondered though, because the company that sold the military our food, was the lowest bid with the best “perceived” value. Have you wondered also what is in the produce at your local grocery store? I have known many grocers, I was one after I started my own grocery store 10 miles from the Canadian border in 1980. I wanted to ensure that I only sold the best produce, and the best food. After all, I was surrounded by people that usually grew their own food. That is where I started researching “Organic” Farming and Gardening. I went to the county extension agent, as well as a local college. I also talked to quite a few gardeners and farmers who were doing their best to produce good healthy food. Organic food: Organic refers to the way agricultural products and foods are grown and processed. Organic production is based on a system of farming that maintains and replenishes soil fertility without the use of toxic and persistent pesticides and fertilizers. To maintain the integrity of the final product, organic foods are minimally processed without artificial ingredients, preservatives, or irradiation. Don’t use synthetic pesticides, herbicides and soil fumigants. You may find the word “natural” grown foods, but that is not the same. There has been quite a few changes in the requirements over the years, but to break it down into what you need for a Basic Organic Vegetable Gardening plan is simple. Let me help you with what I learned. You need land to grow on that is not impacted by other properties or roadways to the point where pesticides,herbicides and soil fumigants have the ability to infiltrate your crops. You should also know the history of the land if possible. You can have your soil tested locally, contact your local County Agriculture Extension Agent. A great resource for great Organic Vegetable Gardening is The University of Florida . Information is provided by James M Stephens a professor of Horticulture Science Dept. and the Cooperative Extension Service. Now that you have a safe place and good soil to start your Organic Vegetable Gardening Journey, It is time to Choose your compost. Alpaca manure is a very good source for compost. You will need to learn how to properly prepare your material for compost so that it will be beneficial food for your plants. Seeds! Yes, I prefer heirloom seeds, which means that they have been gathered and saved for at least 50 years. Which means the fruit of the vine has been proven. Containers to grow in or the ground to be prepped and readied for your crops! Time and energy to enjoy the process. As well as diligence in selecting many various items that conform to the Organic standards. It is well worth the effort! I suppose that I could have just given you the short list without all of the facts, but your health and enjoyment of the food you are going to eat yourself, as well as family, friends and even possibly customers is important to me. 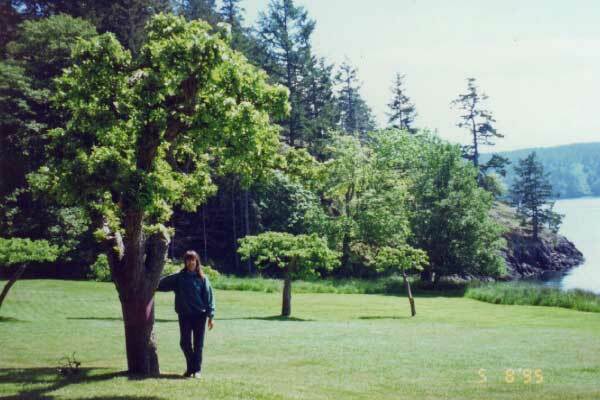 Since I have chosen to get back to what I love doing, my passion, being a Caretaker of people and the Land, not only has my life improved tremendously, so has my health. I have been and continue to be blessed by many new friends that have become my Chosen Family! That is why I am so looking forward to being able to answer your questions and help you build the Life you have always Dreamed of. Having a Great Organic Vegetable Garden is a great way to meet people and make a difference in your community! If you would like to tell us a story about your experience in Farming or Gardening Organically, I would love to hear it. If you have questions that I can answer those are welcomed also! If you have not started receiving our “Growing Newsletter”, I invite you to start getting all of the great information that we share on a regular basis. Just fill out the form below! Have a great Growing Year! Are Plant Stands Functional Art? Posted 10:21 am by Chris & filed under Plants. Are Plant stands really just functional art? As I look around it seems as if every store that my wife and I go into lately there is more stuff to purchase. Believe me when I tell you, these plant stands really have improved not only the free space in our home, they really have enhanced the “Feel” of our indoor garden. One of the most important areas of our life is being able to provide an atmosphere of Peace and Joy for my wife and I whenever we get some time in the house. When we work together outside and are done for the day, it is so enjoyable to just sit in the quiet with the plants and their elegant stands that enhance the beauty of the foliage. There are a myriad of styles and types of plant stands, what you enjoy, and your décor will tell you what is “yours”. If you like the feel and look of wood, you can use dimensional lumber for your plant stands. There are plant stands that look like they were made for the railroad. We have even seen plant stands made from the branches of trees woven together with a nook made specifically for a certain size and type of plant to flourish in. Metal plant stands come in too numerous ways to tell you about, but as you can see that is the style that we like. The Metal offsets the feel and look of the wood floors and brings a “solid” feel to the home. 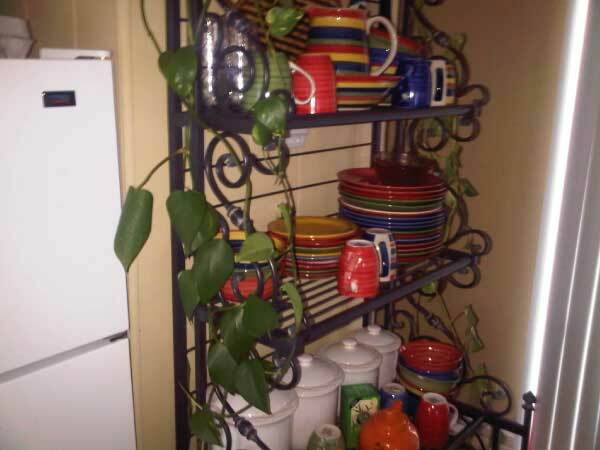 We also have baskets, Pots, bookshelves and tables and desks that house and keep our plants off of the floor. Besides, who do you know that just throws a bunch of dirt on the floor and plants a plant? Not many people, but it does make it easy to sweep the dirt into a pile. You do not even have to have a dust pan anymore! Just kidding, But I do remember as a kid, that keeping the porch clean was easy as we made a game of seeing who could get the most dirt into the potted plant three stairs down on the front of the porch! No wonder it took us three or four hours to get that chore done! You have probably also seen concrete and brick Plant stands also. Heather wants you to remember that the older ceramic pots for plants may have been painted with lead, and must be treated to protect the plant from being poisoned. The other items to treat is also metal and concrete for planting. You do not want the rust or the chemicals from those items leeching into your plants soil and doing harm to your plants. 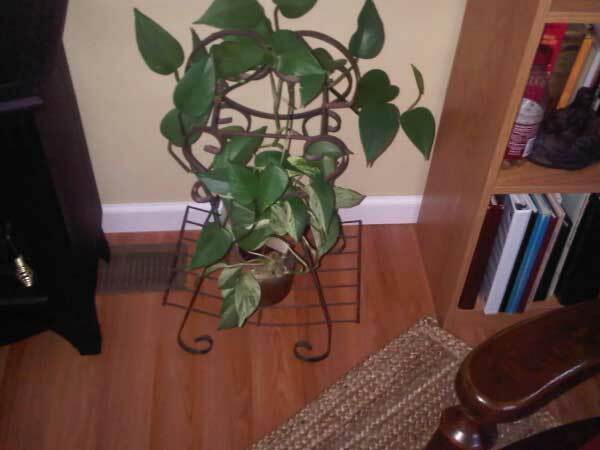 Do you have any tips that you use for your decorative plant stands? We would love to see what your most elaborate plant stand is! I have seen manure spreaders filled with dirt, and of course compost, and then planted with a mobile garden of flowers and some other greens. The most bizarre plant stand I have seen, in pictures only, is the one of a bus in New York city on top of a bus! What a great idea! At harvest time, you can get a fresh snack on your way on or off the bus if you can reach the low hanging fruit! Looking forward to your comments and suggestions to all of us who enjoy the fruits and vegetables of this world! Chives vs Green Onions: which is better? Posted 6:55 pm by Chris & filed under Organic Gardening. Chives vs Green Onions, that is a question of taste. Even though they are of the same family, one is feminine than the other. One, the chive, reminds me of a solid plant that grows many hairs. You can keep cutting the greens as they grow, and as long as you water and nurture them, they will continue to supply you with a light almost onion flavor that is prim and proper when added to soups, salads, and on top of baked potatoes. Green Onions on the other hand, are more masculine. They can have a nice strong flavor that adds much to the baked potato, soups and salads. Not only that, when you go out to the garden, you pull those long green Organic Onions out of the ground with your bare hands! No need for shears or clippers, I really enjoy getting my hands dirty! The treasure of what you will pull up out of the ground is an adventure in taste and texture. With a green onion, I can pull it up out of the ground, pull the outer layer of the green onion off and then bite the end off. The taste of the fresh onion strong on my tongue, I get to take bite after tasteful bite of one of the Creators best vegetables ever created! I get to hold it in my hand, starting with the white mild end of the green onion, and work my way down to the spicier green ends that give me that slight burn in my taste buds. Now the chives on the other hand just do not give me the same chewy goodness of the more substantial Green onion. They have the light taste that only gives me a hint of oniony flavor that I seem to crave when I want to add a flavor to my dishes. Heather, my wife, she likes the chives better. She thinks that the green flavor of the chives is stronger than the green onion. I disagree, because they are so small, you have to add much more of those tiny little stems to even come close to the flavor of just One green onion. She likes the chives because of their small size and that they are easy to chew. I like to take big bites of a green onion and taste both the white and green portions together to delight in what has been created. She likes the lighter mellow taste of just a few of the chives little green taste. Now do not get me wrong, Chives are ok for their purposes, If you like the small new potatoes that are picked early, or the potatoes that you harvest that are small, chives are good for quick meals that you want to consume when entertaining small children. So my point of view on chives vs green onions is that green onions are the way to go. If you want to enjoy the flavor of a vegetable that will stick with you for a while, choose the Green Onion! As the song from the 70’s went : “Chive Talking” what the heck did that mean anyway?